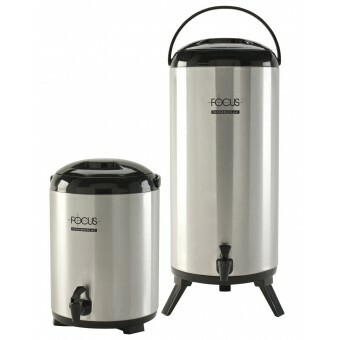 Focus Foodservice has a great selection of “well-dressed” brushed stainless steel beverage dispensers that offer style and durability that cannot be matched by typical plastic and glass-lined competitive units. These dispensers raise the bar on better beverage service with ergonomic, convenient, time saving features. 18-10 stainless steel body and 201 stainless steel interior. Great performance with both cold or hot beverages. A drop handle for easy carrying, and pivots out of the way while in use. They are foam insulated to maintain desired cold or hot beverage temperatures longer. Durable stainless steel interior will not affect taste, smell or color of beverages. Will not break like glass lined models. Brushed stainless steel exterior minimizes appearance of fingerprints. Locking lever feature allows for quicker, hands-free dispensing. Legs elevate spigot height for larger capacity cups. Fold down for compact storage.